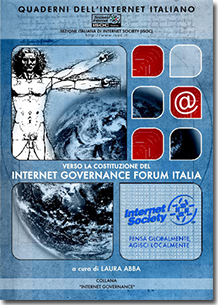 The Italian chapter of ISOC, named Società Internet has 100 individual members and other 120 persons that participated in the discussion on the subject, through our mailing lists. After our internal consultation, we welcome the opportunity to give input to this process and to submit the following responses to the questions raised. We intend to express our positive evaluation of the initiative of NTIA to start a public consultation on such a delicate and contentious matter; the only critical note we raise is the late announcement and consequent short time to respond. Q1: The DNS White Paper articulated principles (i.e., stability; competition; private, bottom-up coordination; and representation) necessary for guiding the transition to private sector management of the Internet DNS. Are these principles still relevant? 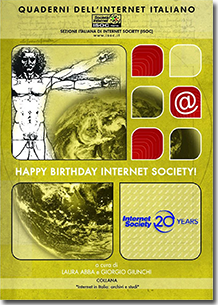 Should additional principles be considered in light of: the advance in Internet technology; the expanded global reach of the Internet; the experience gained over the eight years since the Department of Commerce issued the DNS White Paper; and the international dialogue, including the discussions related to Internet governance at the United Nations World Summit on the Information Society (WSIS)? R1: Isoc.it is convinced that the principles expressed in the White Paper are still valid and keep their initial relevance. In particular, the continuous expanding of international reach of the Internet can best be accommodated and further supported by these principles. The outcome of the WSIS process, in our view, does not contradict the White Paper principles. We believe that management of the DNS is best served in the private sector and wholly endorse the view of the UN Secretary General at the World Summit on the Information Summit: “I believe all of you agree that day-to-day management of the Internet must be left to technical institutions, not least to shield it from the heat of day-to-day politics”. Q2: The DNS White Paper articulated a number of actions that should be taken in order for the U.S. Government to transition its Internet DNS technical coordination and management responsibilities to the private sector. These actions appear in the MOU as a series of core tasks and milestones. Has ICANN achieved sufficient progress in its tasks, as agreed in the MOU, for the transition to take place by September 30, 2006? R2: ICANN has made outstanding progress since its establishment although further improvements may be achieved. Our overall evaluation is positive considering the series of tasks and milestones envisaged in the MoU. Some of those are of a general nature and are subject to subjective judgment like the part regarding the inclusiveness of all stakeholders; it is clear, in this respect, that the achievement is not yet completed but is far along the established path. In the end, we do not see reasons to delay the transition after September 2006; if this will not finally judged as the case by the DoC, we would like to see a much lighter substance and language in the extension of the MoU, compared to the present one. Q3: Are these core tasks and milestones still relevant to facilitate this transition and meet the goals outlined in the DNS White Paper and the U.S. Principles on the Internet’s Domain Name and Addressing System? Should new or revised tasks/methods be considered in order for the transition to occur? And on what time frame and by what method should a transition occur? R3: We first observe that The “U.S. Principles on the Internet’s Domain Names and Addressing System” gave rise to an interpretation of substantial discrepancy if compared with the White Paper and we concur with that impression. We understand though that the rational in the “U.S. Principles on the Internet’s Domain Names and Addressing System” is aiming at assuring the long term stability of the network and that, until now, there are not different internationally agreed models that satisfy the governments expectations to play an oversight role in the global governance of the DNS. We think that, in order to lower the push of some governments in the direction of a global governmental control the Internet, the U.S. government should make a sensible step back in supervising ICANN, as it was envisaged in the White Book. For example we believe there is no longer reason why the DoC has to provide it’s final approval for any even small change of the root zone file. ICANN endeavors a major confidence. Q4: The DNS White Paper listed several key stakeholder groups whose meaningful participation is necessary for effective technical coordination and management of the Internet DNS. Are all of these groups involved effectively in the ICANN process? If not, how could their involvement be improved? Are there key stakeholder groups not listed in the DNS White Paper, such as those with expertise in the area of Internet security or infrastructure technologies, that could provide valuable input into the technical coordination and management of the Internet DNS? If so, how could their involvement be facilitated? 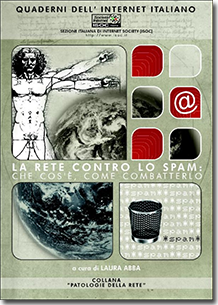 R4: ICANN has been careful until now not to go beyond its core business. Since there are expectations on ICANN to enter into areas that are not strictly related with DNS, although in some way related to it, and the Internet community has growing expectations on ICANN (that is considered a good model for organizing the private sector in satisfying the needs of the community in the governance of the Internet), we should be careful here to introduce (or not) new stakeholders that will enlarge the spectrum of activities of ICANN. The funding model of ICANN should be revised in order to foresee funding contributions targeted to functions that are of interest of the new stakeholders. We are referring here to security problem that could be of interest of the ISP sector (not only those involved in DNS), to Internationalized Domain Names and problems connected to contents, to migration to Ipv6, etc. Q5: The DNS White Paper listed principles and mechanisms for technical coordination and management of the Internet DNS to encourage meaningful participation and representation of key stakeholders. ICANN, in conjunction with many of these key stakeholders, has created various supporting organizations and committees to facilitate stakeholder participation in ICANN processes. Is participation in these organizations meeting the needs of key stakeholders and the Internet community? Are there ways to improve or expand participation in these organizations and committees? R5: If we look at the three existing supporting organizations, it is evident that the ccNSO is the one that is still less inclusive as a consequence of some difficulties of tuning the formal relations of ICANN with the country code registries. Improvements are on the way but the process is going slowly. To date, the ccNS has not attracted many European ccTLDs and consequently cannot yet be seen as a means of inclusive ccTLD participation, although they are numerous and vocal in ICANN meetings. We note that steps have been taken to amend the ICANN bylaws with respect to the ccNSO. For what regards advisory committees, we note that the process to a full participation of registrants and end users through the At Large Advisory Committee has not been completed yet. This is due to the inherent complexity of the task, but also to the lack of incentives, and in particular of direct influence over final decisions. 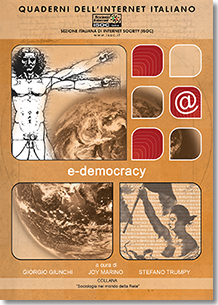 Given the original reasons given in the White Paper – where a significant representation of users at the voting Board level was foreseen as a balancing element to preserve the general public interest – we think that ICANN should be invited to find ways to restore in part such representation. Q6: What methods and/or processes should be considered to encourage greater efficiency and responsiveness to governments and ccTLD managers in processing root management requests to address public policy and sovereignty concerns? Please keep in mind the need to preserve the security and stability of the Internet DNS and the goal of decision-making at the local level. Are there new technology tools available that could improve this process, such as automation of request processing? R6: It is of utmost importance for the stability of the DNS, and ultimately the Internet, that the root database is managed as a technical function; this is absolutely necessary for the country codes. We advance the request that the present procedure concerning modifications of the zone file records regarding ccTLDs skips the final step of approval by DoC; ICANN should be given the credit to interpret independently its technical role. This is the only sound way, to our opinion, to respect paragraph 63 of the Tunis agenda (Countries should not be involved in decisions regarding another country’s country-code Top-Level Domain (ccTLD). Their legitimate interests, as expressed and defined by each country, in diverse ways, regarding decisions affecting their ccTLDs, need to be respected, upheld and addressed via a flexible and improved framework and mechanisms.) and the paragraph 2 of the “U.S. Principles on the Internet’s Domain Names and Addressing System” that reads: “The United States recognizes that governments have legitimate public policy and sovereignty concerns with respect to the management of their ccTLD. As such, the United States is committed to working with the international community to address these concerns, bearing in mind the fundamental need to ensure stability and security of the Internet’s DNS.” In light of this, ICANN should respond without delay to notifications of changes to the information in the IANA database submitted by registry managers provided they pass the necessary technical checks. Such checks must follow a clear and transparent process according to objective, non-political and publicly available criteria. Q7: Many public and private organizations have various roles and responsibilities related to the Internet DNS, and more broadly, to Internet governance. How can information exchange, collaboration and enhanced cooperation among these organizations be achieved as called for by the WSIS? 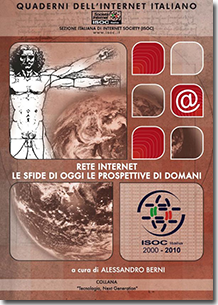 R7: Isoc.it looks to the Internet Governance Forum to provide the arena for global discussion and common action on the issues highlighted by the WSIS regarding the broad definition of Internet governance. We do not believe that any additional bodies are required. 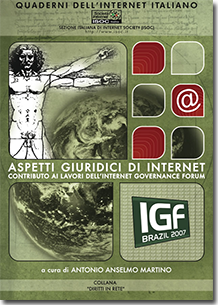 IGF will have positive results if all the organizations involved, both of a private and intergovernmental nature, will take the commitment, in the near future, to be more synergic than they are at present. The Internet community requires that strongly; this is the message to be passed in Athens.